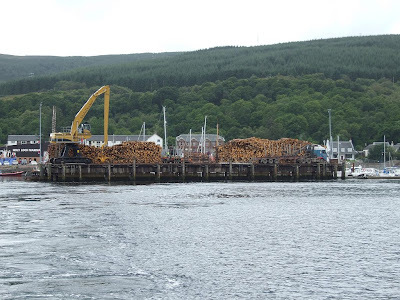 Another ship is due at Sandbank this evening to load timber. This view shows the latest cargo being stacked prior to the arrival of RED DUCHESS on her second visit to Sandbank this week. At the east end of the pier (left hand side in this picture) is the recently acquired MultiDocker loader used to load the ships calling for timber. Previously, the ships were loaded using the Hiab cranes mounted on the back of the timber lorries such as the one visible on the pier. Also at the Holy Loch Marina today was the 'smertest boat in the trade', otherwise known as the Inveraray Maritime Museum's diesel puffer VITAL SPARK of GLASGOW. This vessel, built in 1944 as VIC 72 by Richard Dunston at Hull, was purchased in 2005 by local businessman, and puffer enthusiast, Archie MacArthur. At that time she was named EILEAN EISDEAL, and until just four years previously, had been the last working example of her type, once a common sight in western Scottish waters. 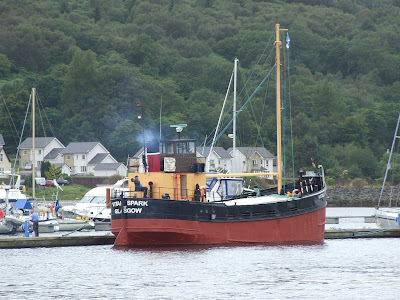 Mr MacArthur decided that a more appropriate name for her would be VITAL SPARK, and she was duly renamed at the Glasgow River Festival in July 2006.